Following questions needs to be answered. This calculator assess the exact surgery as a part of risk assessment. So, it may be a best calculator for this reason. NSQIP is limited on its cardiac complication assessment, RCRI is better in that way. RCRI predicts cardiac complications but NSQIP does not. Hence, probably, RCRI is better. Use lab. Score of 3 or more . 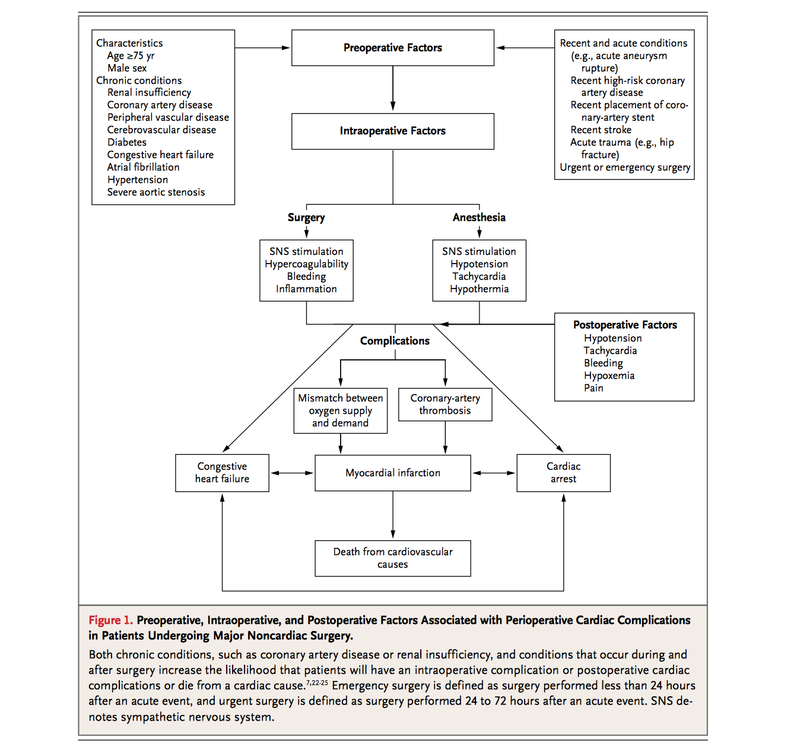 But not all patients with score > 3 have post-op complications. Treat patients with OSA or suspected patients like OSA until confirmed. If previously on it, then monitor for HR and BB. Most complication due to Hypotension, and Bradycardia. Hypotension often lead to stroke. Target Blood Pressure (<130) and HR (60-75). Some clinicians follow more on heart rate than BB. More sensitive BB dosing change. In terms of BB, try to compare it to the baseline BP to decide on hypotension. Perioperative BB started within 1 day decreases preoperative MI, but causes more harm with increased sepsis. Continue BB for appropriate indication if patient has been on it before. Cimzia: Hold 6 weeks Preop. Continue it. 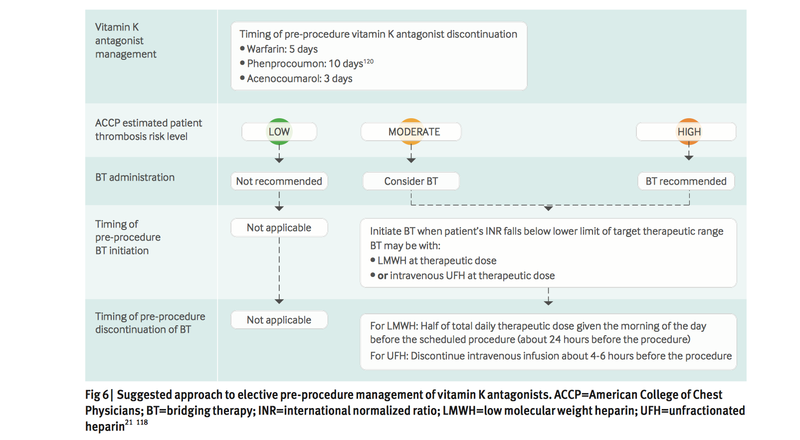 Appropriate DVT prophylaxis. Opiates: Affects REM sleep . REM sleep is suppressed. Shoulder surgery are painful. Ongoing postoperative pain control is important. Compression Stockings: Intermittent Pneumatic Compression. They do not always wear it. No recommendation on when should IVC filter be placed prior to surgery. No literature on this are available. 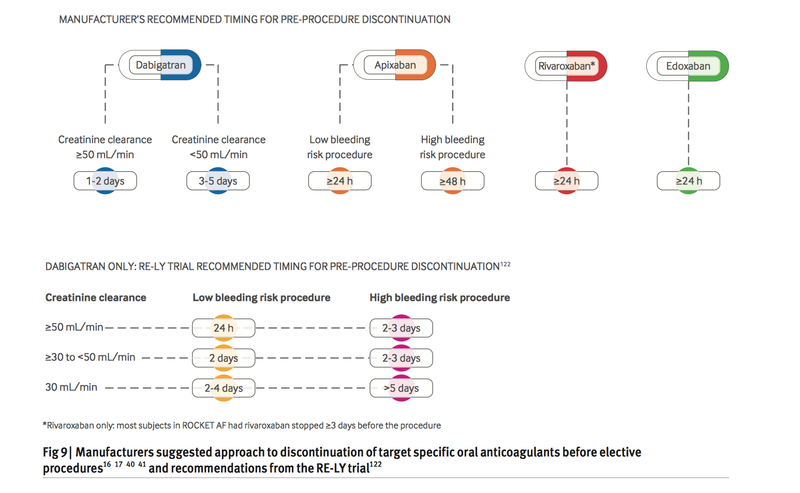 Extended prophylaxis for 30 days after Abdominal and Pelvic Surgery in oncologic patients with some risk of increased bleeding. 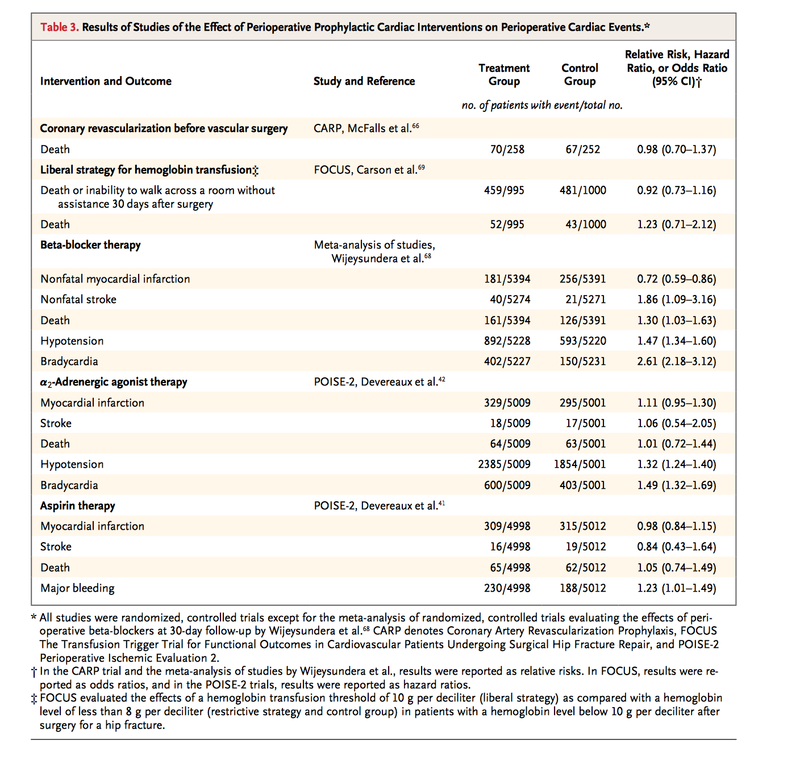 California study ; JAMA 2014: 0.81 % of patients had A fib when it was non-cardiac surgery. When to stop the anti-coagulation medication? Below is the Manufacturer label. Depends on half life, and the risk of bleeding during the surgery? Do they need Bridging (based on risk of VTE risk - moderate or high risk, and risk of bleeding risk during surgery if moderate risk), and if they are bridged when should birding anti-coagulation be stopped prior to surgery? Assess the thrombotic risk, and find if it is low, moderate or high risk? Based on the risk decide on BT. Also, based on when bridging therapy decide on the timing to discontinue bridging therapy prior to surgery? 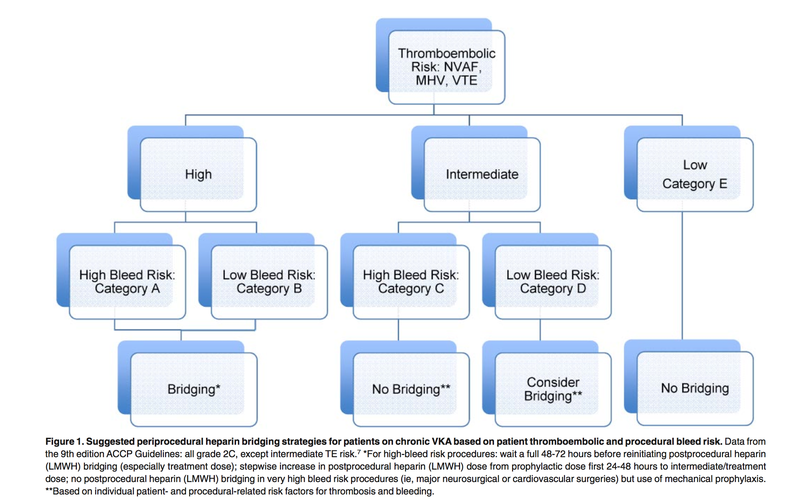 If moderate risk, assess the risk of bleeding to decide bridging or not? How do you decide on the risk of bleeding? When to restart the anti-coagulation? Underestimates the risk in Sickle Cell disease. > 8, its a arbitrary number, some patients has to be in this range. Yes for high risk. No for low risk. If suspected, get an ECHO. Fix hip in 48 hr. If delayed by 48-72 hr, leads to increased mortality, pneumonia, pressure sores.